For other materials, please consult the lab for the suitable sample size. 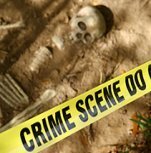 Forensic experts use radiocarbon dating to establish if an individual died recently (perhaps a matter for the Justice Department) or in antiquity (a matter for the archaeologist). They do this by using the “bomb carbon” curve. Living things assimilate radiocarbon from the atmosphere. At any given time, the radiocarbon levels of living things and the atmosphere is ideally similar. The proliferation of atmospheric thermo-nuclear testing in the early 1950s until 1963 added vast amount of artificial radiocarbon (bomb carbon) in the atmosphere, increasing global radiocarbon levels by almost 100% compared to the pre-1950 level. AD 1963 marked the signing of the Partial Test Ban Treaty (PTBT) by the United States, United Kingdom, and the Soviet Union wherein it was agreed that nuclear weapons testing would no longer be performed above ground surface. Since then, the global radiocarbon level of the atmosphere has decreased through uptake in the oceans and biological systems – e.g. the 1970s had higher radiocarbon levels in the air than the 1990s, and therefore so did individuals who were deceased during those times. NOTE: Publications are cited in literature indicating radiocarbon can be used to determine the approximate age of an individual by comparing teeth to bones. Additionally, using the radiocarbon signature within trabecular bone vs cortical bone has been cited as a means of identifying which side of the bomb curve the individual lived (prior to 1963 or post 1963).